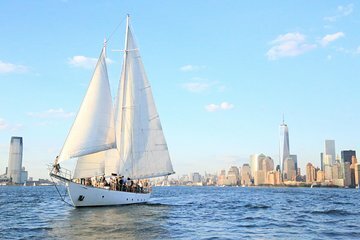 See the best of New York City aboard a historic sailing ship on this 75-minute, daytime cruise around New York Harbor. Enjoy incredible views of the Manhattan skyline, plus landmarks like One World Trade Center, the Empire State Building, the Statue of Liberty, Ellis Island and much more from the water. Set sail to New York City’s waters on board the Shearwater Classic Schooner. Departing from North Cove Marina at Brookfield Place, this unique sightseeing voyage explores New York Harbor with outstanding views of the Big Apple’s best attractions. Shearwater is a classic Newport-style schooner yacht, launched on May 4, 1929, but only recently recognized as a national landmark in 2009. Choose from one of three 75-minute afternoon sails, enjoying beautiful views of New York City landmarks like the Statue of Liberty and Ellis Island, Governors Island, plus the New Jersey and New York City/Manhattan skylines. Celebrate a special occasion and/or get a unique view of New York City from the water. Way overcrowded, not enough seats. My Wife and I actually decided to not even take the Sail, once we say how crowded and no seats available. For a ship this size, with limited seating, the passenger count should be significantly less for a more enjoyable and memorable experience. Moving forward I will no longer be using your Services and disappointed in the misleading information prior to sailing. Awesome trip....enjoyed the crew! I would recommend this trip! The tour was great, and the schooner was a very relaxing way to travel. However the weather forecast was for storms and high winds which was a worry leading up to the trip. We were told that we had to turn up and the sail be abandoned before they would give us a voucher for an alternative date.